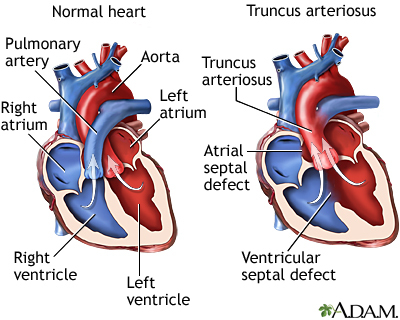 Normally the aorta arises from the left ventricle and the pulmonary artery arises from the right ventricle. In truncus arteriosus both vessels are combined into one vessel. A hole between the two ventricles is usually also present. As a result, unoxygenated and oxygenated blood mix completely. This causes too much blood to be sent to the lungs and not enough oxygentated blood to get to the heart and the rest of the body.